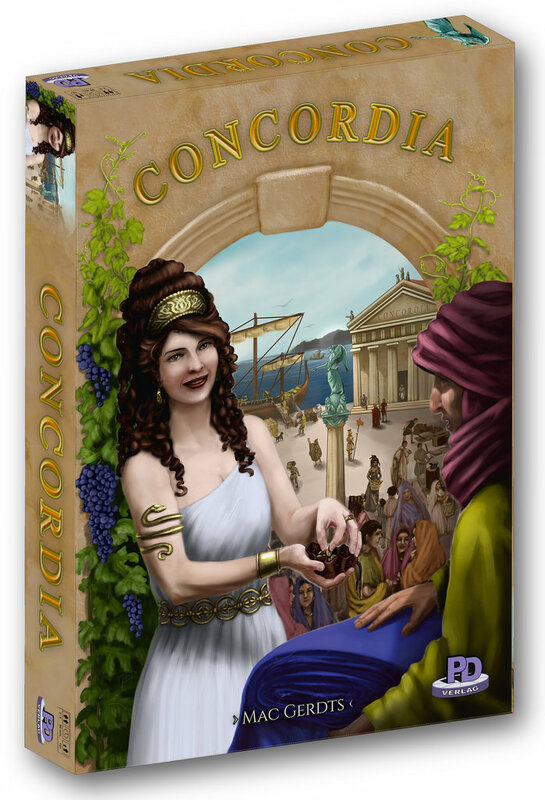 Concordia is a Roman-themed game by Mac Gerdts, known for his rondel game mechanic games such as Navegador and Imperium. However, Concordia doesn’t use the rondel mechanic (Gerdts has made a non-rondel game before too); instead, it uses cards for both actions and scoring. 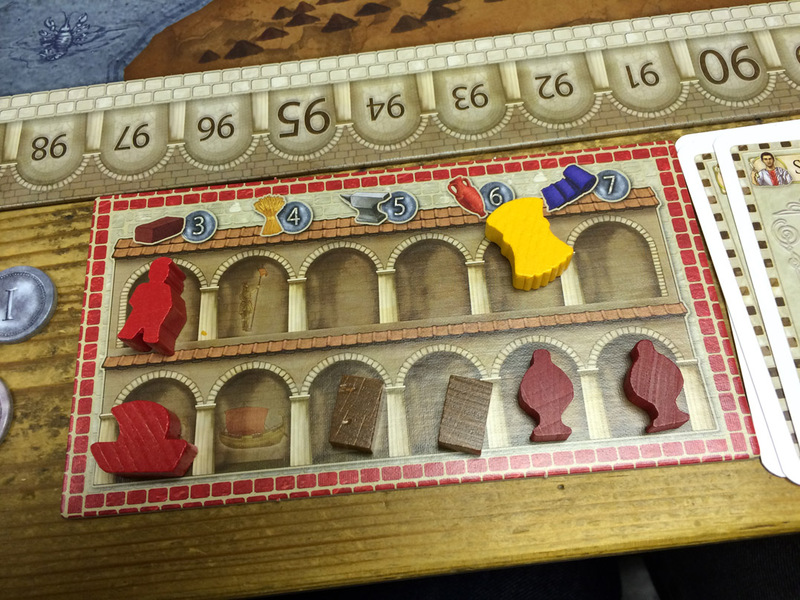 The main board shows Europe (3-5 players) or Italy (2-4 players) which is divided into provinces and each province contains several cities. 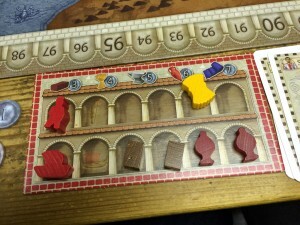 The type of good that each city produces (bricks, food, tools, wine, cloth) is determined at the start of the game which adds some variety in replay. 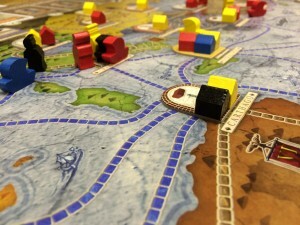 Players have land and sea colonists which they can move around the board via the land or sea routes that connect the cities. Players take turns playing one of their cards from their hand and carrying out the specific action on it. Tribune: All played cards return to your hand (gain 1 cash for each card minus 3) and can spend resources to place 1 new colonist. Before going further, I’ll quickly explain the Prefect card. At the side of the board is a set of tokens (one for each province) showing cash on one side and a good on the other. When playing a Prefect card, the player chooses a province whose token shows a good – all houses in this province generate their city’s resource (for all players), plus the player triggering this gets a bonus good of the type on the token. The token is then turned over to show the cash side. Alternatively, when a player plays a Prefect card, they can gain cash equal to that shown on all tiles showing cash, and then all the cash tiles are turned over to show their goods side again. Players each have their own board showing their storehouse with 12 spaces on it and each space can hold 1 good. At the start of the game, 4 colonists occupy 4 storehouse spaces so players have more room for goods once they place more of their colonists on the board. Once an item is in the storehouse, it can only be removed by selling it or spending it – players can never choose to throw things out. This limited storage means you need to balance what you generate and purchase carefully. It can be especially important/annoying/humorous is a player plays a Prefect card that generates resources which fill-up an opponent’s warehouse with goods they don’t want. The game ends and is scored either when the last card has been bought, or when a player builds their final house (which earns them 7 victory points (VPs). Each card a player owns at the end of the game earns VPs based on which god is on the card. For example, each Saturnus card scores 2 VPs for each province where they have at least one house, each Mars card scores 2 VPs for each of their colonists on the board, etc. Players with Specialist cards earn VPs for each house on a city that produces the matching resource. The player that scores the most (VPs) wins the game. 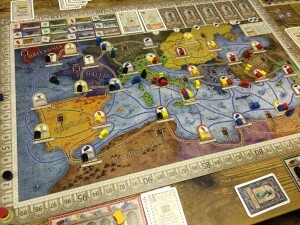 Overall, I really enjoyed Concordia. The card system is very interesting as you try to find a good order in which to use your cards to expand and gain resources and cash; however, you also need to do this in a way that will combine well with your cards when scoring, plus you have limited space for resources. The game is not complicated – in fact, it’s surprisingly simple with only 4 pages of rules – but it offers a constant flow of interesting choices and requires a delicate balance of resources that match your intentions. Being able to play any card in your hand gives you full control (removing the luck of drawing from a deck); in fact, the only luck in the game is the order in which cards become available for purchase. There do seem to be quite a few strategic options to investigate. Use actions and resources to buy lots of cards which score less, or have few cards and use time and resources to make those cards score highly? Use your entire hand of cards before using the Tribune (it can earn cash but only lets you pick up cards and add 1 colonist), or use the Tribune card frequently to re-use a small set of cards that combine well? Focus building houses in few provinces so the Prefect action on that province generates lots of resources, or spread building houses across many provinces so most Prefect actions give you something? Of course, these options do not need to be at one extreme or the other, and you can alter your balance during the game too. In a 2-player game, I built houses across the board on every brick, and many wheat, cities as well as placing all my colonists. To match this, I tried to buy cards that would score for those things (i.e. houses in each province, colonists on the board, and the wheat and brick specialists). I didn’t win but it was pretty close and it could have been a win if I had had just 1 more resource with which to purchase 1 more card when I had a couple of chances at the end. Buying cards is an interesting decision as you want cards that are useful actions to you as well as matching your strengths for higher VPs. Plus, cards get cheaper over time so you want to buy them cheap but before someone else does. Every card is VPs for someone so denying a player a card that is valuable for them can be good for you, even it doesn’t earn you as much (especially true for 2 players). With regards to downsides, I think the game mechanics work really well, but I can see people may a bit divided on the amount of interaction. Player interaction is indirect, i.e. buying a card before you can buy it, using the Prefect’s cash action before you can, having colonists on routes where want yours to be, or houses built in cities where you want to build (as cash costs for building are multiplied by the number of houses that will be on it). I think this factor is magnified in games with fewer players, especially in a 2-player game, as there is less crossover. Playing on the side of the board that makes for the most congestion would help this element a bit. Personally, this negative element wasn’t a big deal for me as it’s not a heavy game; however, I would prefer playing with more than 2 players in future as that was too solitary. In the end, I really enjoyed Concordia and I liked the game’s mechanics and the amount of decision-making it required. 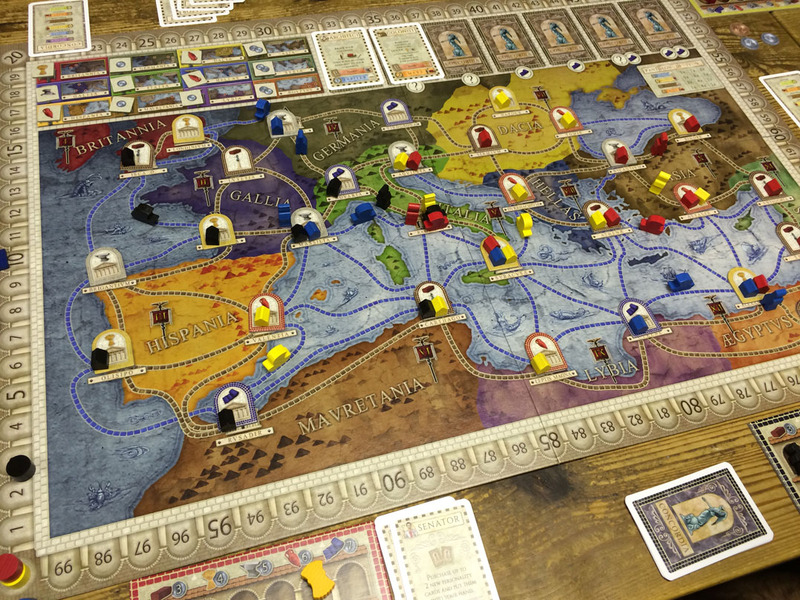 This entry was posted on Thursday, December 5th, 2013 at 7:51 pm	and is filed under Board Game Review, Board Games, Concordia, Essen Spiel 13, Navegador, Spiel 2013. You can follow any responses to this entry through the RSS 2.0 feed. You can leave a response, or trackback from your own site.